These two recordings, made just four years apart, seemed on first hearing to belong to different eras. The stereo 1956 recording of the Concerto No. 1 was excellently made; this remastering serves only to enhance an already fine sound and breathe a little more life into it. By contrast the 1952 Concerto No. 2, made at Kingsway Hall rather than Abbey Road, has been greatly revived from its dim and dull origins, and cured of the majority of the flaws identified in its first review in 1953 as a result. I've also been able to cure the wow and flutter issues referred to in the review, and despite the mono sound, this Ambient Stereo presentation, retaining the central mono image but allowing reverberant space around the performers, goes along way to bringing the older recording up toward the very high technical standards set by the first concerto. It may be that Solomon gives slightly the more elegant performance of the concerto, Rubinstein slightly the more powerful. But it is quite Certainly the case that both solo performances are in the very first class; less certainly the case that both orchestral performances are, for the New York orchestra does here and there lack something of both the poetry and the precision the Philharmonia do unfailingly bring to the music. A predisposition on these grounds in favour of the H.M.V. version is further strengthened on consideration of other factors; for though both stereo records offer excellent sound in the quieter passages of the music, the fuller tuttis are more richly as well as more clearly handled by the H.M.V. Both soloists use Beethoven's own cadenzas to the first movement: Rubinstein a version of No. 3, Solomon No. 2, which I hope it will not seem too much of a backhanded compliment to say has the great advantage of being very much shorter. If any further evidence is needed before making a choice, consider H.M.V's bonus, surely a convincing one: Solomon giving a serene performance, beautifully recorded, of the Beethoven late E minor piano sonata. Choice, indeed, seems to me to be selfevident; but this is most certainly not to deny the many beauties of the Rubinstein performance. Any new recording of the B fiat Concerto actually the first of Beethoven's five for piano, despite its numbering — is up against stiff competition from the Decca version by Backhaus and the Vienna Phil, which M.M. praised in the February issue for its sobriety, its avoidance of any striving after effect, and its fine full recording. I fully agree with his assessment of that disc, though he did not mention two details in the first movement which worried me — the sudden spurt in tempo at the development, and the flatter pitch of the (obviously inserted) cadenza. Solomon, while still making it clear that this is early Beethoven and not Mozart, takes the work less weightily, with what might almost be thought a "period" sense of proportion. The first movement is taken rather faster than in the Decca issue, and both soloist and orchestra give us admirably alert playing which stresses the con brio part of the tempo-indication. This care over authentic tempi i- observed again in the following movement, which already, in this his first major orchestral work, foreshadows Beethoven's later "pathetic" style; the slow speed adopted is a true Adagio. It is unfortunate that the recording does not match the quality of the performance: the orchestral opening is rather flimsy in tone, and the piano's first entry sounds almost as if its microphone is not properly "up" — in general, indeed, the soloist seems rather distant, and he is at times almost concealed by the strings. In the cadenza there is some distortion, while in forte passages of the Adagio the tone is c.ongested, and long sustained piano notes suffer a faint but persistent "wow". A pity, for this is a performance worth better presentation. Beautiful, beautiful, beautiful. The English pianist Solomon, as he billed himself professionally, has flown mostly under the radar of classical-music lovers outside Britain. I'm not sure why, although this situation has recently begun to undergo correction. Perhaps his obscurity stems from the stroke he suffered in 1956, which froze his right arm. Although he lived another 32 years, he never performed in public again. During his absence, other pianists came to notice, and the lack of Solomon recordings in new formats put him further in the shade. I first heard him in his classic recording of the Arthur Bliss Piano Concerto. It didn't impress me, but my dissatisfaction arose from the piece itself as well as from the muddy EMI sound. The Beethoven recordings issued by Pristine reveal one of the finest pianists of the previous century and one of the great Beethoven pianists, period. It so happens that Beethoven's first piano concerto (EMI, with Schnabel and Sargent) introduced me to the cycle. Up until I heard Solomon, Schnabel's was my favorite performance. The two earliest piano concerti don't get the respect of the latter three, but those three blaze new trails. One could trace almost the rest of the Nineteenth Century's piano concerti to one of them -- the Schumann to No. 4, the Brahms to No. 3, the Tchaikovsky to No. 5, for example. However, numbers 1 and 2 represent supreme examples of the Mozartean concerto, particularly the "martial" concerto. Mozart wrote many different kinds of concerto -- martial, pastorale, buffa, and so on -- but Beethoven pretty much stuck to the one subgenre, although he expanded its musical and expressive range. Concerto No. 1 (actually written after the designated second) asks the question, "What's not to like?" Its witty outer movements brim full of surprising turns and themes of high invention, a bit like Papageno's music in Zauberflöte, while the stunning largo ponders, to paraphrase Blake, eternity in a moment -- the mood of the slow movement of Mozart's Concerto No. 21. Although more tightly bound to the immediate past, Concerto No. 2 nevertheless revealed Beethoven as the composer to watch. The themes follow classical models more closely, but Beethoven kicks them over like sand castles in his treatment of them, as early as the first paragraph of the first movement. He breaks up the boxiness of the phrasing not only with rough syncopation but with wild modulations to distant keys. The second movement strikes me as a rehearsal of the largo of the official First, a "pathetic" opera aria for piano and a good example of its type, but without the latter's special transcendence. The third movement rondo is a symphonic view-halloo, a rapturous ride through the pastoral landscape. Based on what Solomon does in these two works, you can safely bet that his Mozart will be wonderful as well. Let me say first that Solomon's interpretations of both concerti have become my new favorites, surpassing even the Schnabel/Sargent No. 1. He gives both a Mozartean elegance, with a beauty of tone that out-pretties Van Cliburn in the Tchaikovsky, while maintaining a profound understanding of what he plays. His touch is yummy, his runs like perfect little diamonds. A superb concerto partner, he always occupies the most appropriate place in the texture, but he also stands out in the concerti's cadenzas, especially that of the Second's first movement -- a fugato, composed years after the concerto itself, and thus perhaps a bit jarring. It would be picky to complain, however. It's almost a sonata movement in itself, with a wonderful idea that reminds me of Wile E. Coyote spasmodically scrabbling for a hold in thin air as he falls the usual impossible distance. However, a great concerto performance means to me a great partnership between solo and orchestra. Herbert Menges seems to me a great conductor overlooked among the talent in England. He matches Solomon elegant point for elegant point in the Concerto No. 1. André Cluytens is bit looser, but perhaps a bit warmer as well. On the other hand, Menges has the advantage of a beautifully clear stereo image. Unfortunately, stereo came in at the end of Solomon's career. There can't be many more such recordings. 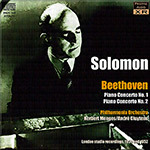 In the weeks to come, however, I will review Pristine's complete Solomon-Beethoven concerto cycle. Andrew Rose has made it Pristine's mission to offer recordings of historically-important recordings in the best possible sound. The stereo EMI recording has been restored to probably better-than-new, while the mono Second Concerto avoids the flat tinny-ness associated with "historical" recordings. It sings, as I have hinted, in a warm, round tone.